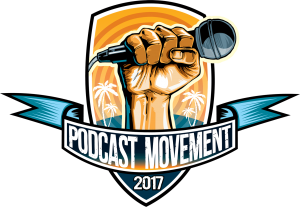 Win 2 tickets to Podcast Movement (#PM17), on us! Podcast Movement is the biggest podcasting conference on the planet, and we want you to be at the next one! Enter to win 2 x Podcast Movement (#PM17) tickets courtesy of Podcast Websites! 2 standard tickets up for grabs! Important: it's best not to enter with a generic email such as "info@", or "office@". Enter the #PM17 ticket giveaway, now! You can enter as many times as you like and the more you share the competition, the more entries you will be given. Winners will be chosen at random using our randomising software for complete fairness to all entrants. The prize is 2 x Podcast Movement 2017 standard tickets. The final draw will take place on May 12th 2017 and the winner is responsible for all accommodation and transport. Podcast Websites will provide 2 x standard tickets only. Entering your email address above will gain you one entry to the contest. You will then be given a personal referral link to share. The more you share that, the more likelihood you have of one of your friends entering using that link. For each friend who enters, you will be granted one more entry into the contest, increasing your chances of winning. Winners are selected at random so the more entries you have in the pot, the more chance you have - there is no limit! We will also news and content relating to podcasting or Podcast Websites' products and services that help podcasters. By submitting this form, you consent to this. #PM17, August 23rd-25th, Anaheim, CA. Contest closes at 5pm Eastern on May 11th 2017.